If you haven't already then make sure you read Andy Freeman's original two-part piece of Johnny Scott. The first part covers his childhood in Belfast and time at Manchester United before a transfer to Grimsby, while the second continues his Town career, appearances at the 1958 World Cup and concludes with his death at the young age of 44. Dave Herriott was there to see Scott's debut at home to Notts County in the 1956-57 season. Town had taken a single point from the first two games of the season, both away fixtures. "A day after my 16th birthday Johnny Boy made his Town debut and scored the winner against Notts County! "I lived in Lincoln at that time and my late father who was an avid Town fan befriended most of the players. Johnny, Don Donovan and Mike Cullen would come over to visit my parents at their shop in Lincoln. I remember well how quiet the three players were and how they called my late mother Ma'am – so humble! "I also remember a time Johnny missed a penalty in the Pontoon end and the shot broke someone's glasses. Johnny met the poor guy to apologise – I think it was in the Telegraph at the time." Ouch! I ran this past Peter Markie, a sports reporter for the Grimsby (Evening) Telegraph at the time who often wrote under the 'Blundell' byline. "I was at the game but it's hard now to remember all of the detail, but yes, a Scott penalty that broke someone's glasses! What a squad; talented players but just short of the top, although Don Donovan had enjoyed the high life as an Everton regular and gained a few caps for Ireland. "He had a wild streak and didn't take any prisoners on the pitch when the going got rough! On his day he was almost international class but had issues with temper and attitude which explained a too short career and, I suspect, his short stay at Old Trafford. "I was tipped off by Billy Evans [former player who went on to become assistant coach – ed.] as I was making my usual midweek call at the ground when he caught me on my own. There had been some kind of showdown during training that morning involving Johnny and manager Allenby Chilton. Further probes suggested punches had been thrown! "I caught the first bus back to the Telegraph office where sports editor Roy Line made further calls and we finished up with the story. It drew national paper interest and held the headlines for several days. I remember the club called a special meeting, probably on Friday of that week and chairman FA Would started it off along the line of "we have a snake in the grass here" or words to that effect! I remained a picture of innocence. It helped me to break into the nationals and the Belfast papers with some very surprising but much-needed cheques at the time!" 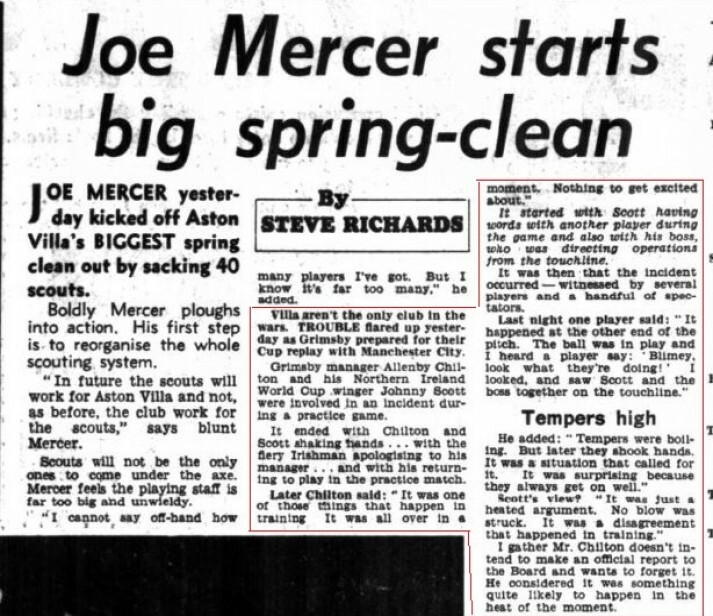 A manager and star player scrapping, some 40 years before Brian Laws and Ivano Bonetti would repeat it! We had a delve through the archives for this and came up with a headline in the Mirror and a mention in the Daily Herald. "Blimey, look what they're doing" indeed! I don't think this contradicts the recollections of Scott as a rather polite gentleman off the pitch but instead probably demonstrates Scott's passion when playing the game, whether in a competitive match or training. "For me, Johnny Scott was the finest and most skilful player ever in my time of watching the Mariners. I can still recall as a young boy watching his great ball juggling skills in training and spinning the ball on his finger like a Harlem Globetrotter! I would contest that he was fast though; if he had been he would have been completely unplayable, but what he had was the skill to beat a man all-ends-up without hardly moving. It's something that cannot be coached, and is a lost art in today's high-tempo game. "He was part of the great Scott, Rafferty, Fell forward line. He would receive the ball at his feet, draw defenders towards him. It wasn't just the dropping of the shoulder though, it was flicking the ball onto his heel and then over the defender's head and then turning round and beating them again with another piece of skill from his locker! He would then transfer the ball with precision and accuracy across the pitch to Jimmy Fell who would be waiting virtually unmarked on the opposite touchline. He *was* fast and would be off like a rocket towards goal. That's the way to play football! "When he took a penalty there was no doubt it would end up in the back of the net, such was his precision. He also had that great skill off being able to slice across the ball with the outside of his boot, that meant the ball is always moving away from the goalkeeper, and is virtually impossible to save. "My favourite spot was in the Pontoon behind the goal, and I am sure he scored goals direct from corners, I think one was against Fulham. The ball was flashed across, and as if by Magic when it reached the near post suddenly swerved into the goal. "My family did business in Manchester with one of his next-door neighbours from his MUFC days, and he had nothing but praise for him as a person. "Oh, for another Johnny Scott! Will we ever be privileged to see such a player at GTFC again? One that was mentioned during a World Cup in the same breath as the Brazilians and Pele?" I would like to thank Andy Freeman for this lovely article. Johnny Scott was my dad and both myself and Johnny's grandson Andrew enjoyed it very much. 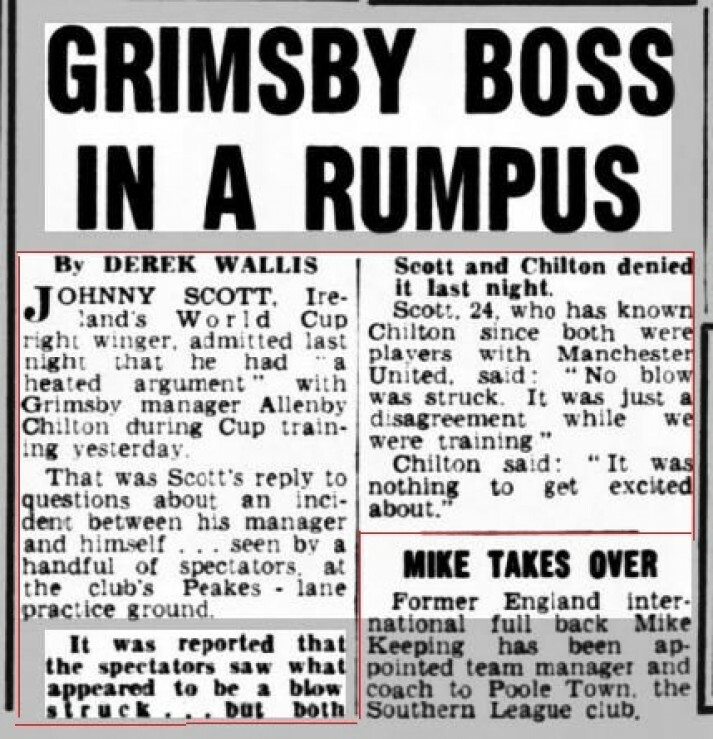 Just one point, I always understood that my dad received a full testimonial at Grimsby Town and was in fact the first player to do so. (We're struggling to find anything on this. Can anyone help? Ed.) Johnny had wonderful memories of his time at Grimsby and held the club and his teammates in high regard and deep affection for the rest of his life. Thansk to everyone who got in touch. If you'd like to share any memories of Johnny Scott or his teammates then please drop us a line, we'd love to hear from you.